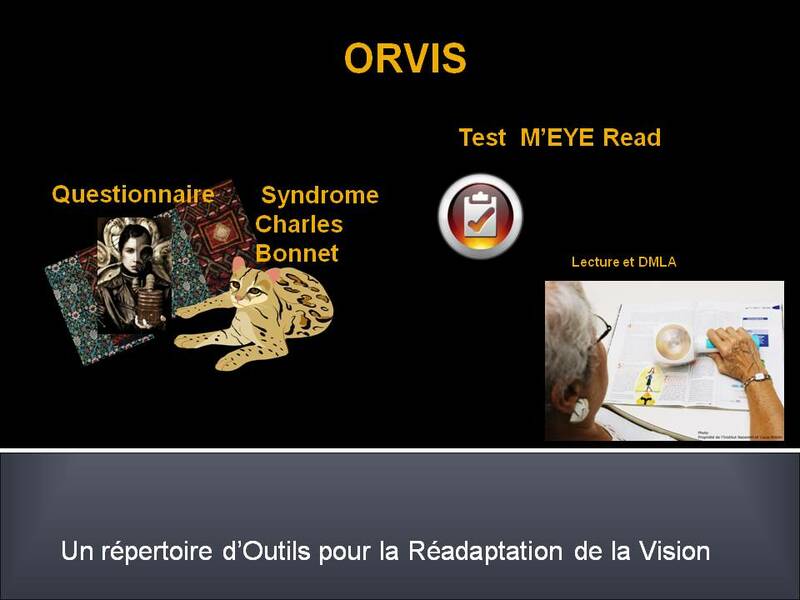 The ORVIS infrastructure aims to facilitate the development and availability of valid and adapted tools that will allow functional, perceptual, cognitive, and psychological evaluation of low vision clients by researchers and clinicians who work in low vision and visual impairment rehabilitation. In addition to the development of three tools and the assessment of their metrological properties, the infrastructure underlies the development of an inventory that identifies and describes both French- and English-language tools whose validity and accuracy have been evaluated or are in the process of being evaluated in the context of a visually impaired clientele. The inventory’s layout is inspired by the International Classification of Functioning, Disability, and Health (ICF) and offers for each tool a data sheet that is compliant with the SGQRI 008-02 standard issued by the Quebec government to ensure its accessibility to people with or without an impairment. The information provided comes from a selective review of the literature and offers characteristics, components, and metrological properties for each tool that are supported by cited scientific studies. To this day, 14 data sheets have been completed. The inventory can be consulted online. ORVIS fills a need that researchers and clinicians have for measurement tools that are valid, effective and appropriate for use in a visually impaired clientele. Such tools are rare—especially in French, little known, and hard to find, and represent a precious resource for researchers who do use them to evaluate the efficacy of treatments and interventions. As it expends, the inventory will become more profitable to the researchers affiliated with the different axes of the network, especially to characterize the clinical populations they are studying. We have also observed a better evaluation of needs in the context of patient care whose purpose is to lead to autonomy and social integration. ORVIS is available at: www.orvis.vision . Between November 2015 and October 2016, the inventory has been accessed 739 times. Since the last scientific report, the number of individuals collaborating on the project has risen from 29 to 74, which represents a 255% increase. An initial evaluation survey completed in June 2016 by active and potential users of the inventory, researchers, and clinicians has revealed a high level of satisfaction vis-à-vis the early content and the inventory as a whole. Réseau de recherche en santé de la vision and Institut Nazareth et Louis-Braille du CISSS de la Montérégie-Centre.